If Thally is a sample of what the unfolding Shaw restaurant boom will bring, we’re in for a fun ride. The new restaurant by Chef Ron Tanaka and his partners in crime is impossibly creative and simple at the same time. The drink prices ($7 and $8 wine!) and entree portion sizes (not guilt-inducing, nor small plates!) weren’t the only things refreshing at Thally. The restaurant doesn’t feel the need to spell out every detail of how its dishes will be presented on the menu. Rather, they keep it simple and allow guests to be wowed with whimsy when dishes arrive at the table. The compressed watermelon and heirloom tomato salad for example, doesn’t let on that it will come out shaped like sushi with acompanying ginger and wasabi. They trust their customers will pick up on, and enjoy, the surprise. 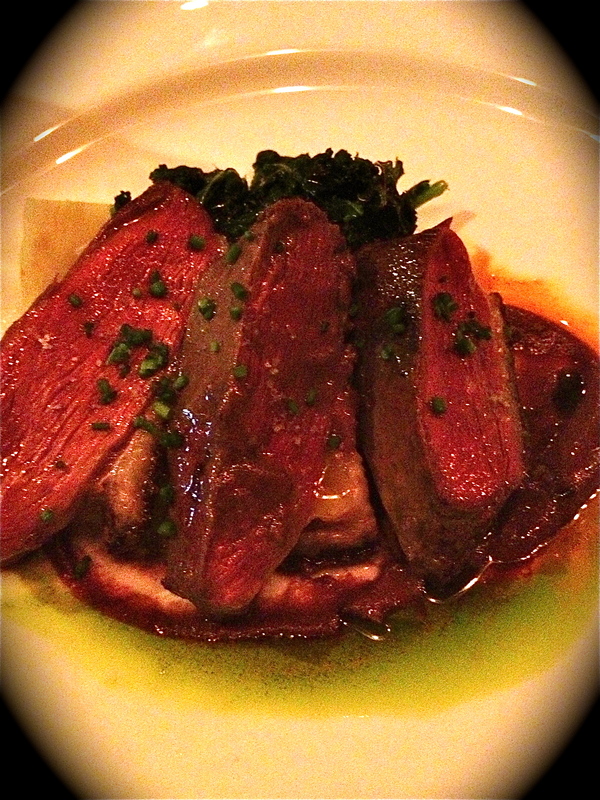 The Best Thing on the Menu: Roasted Duck Breast with Sunchoke, Kale and Taggiasca Olive Sauce wins out on the merits of flawless execution. The perfect medium rare sear and criss-crossed rendered duck fat are executed to such a high level that we wonder whether Chef Tanaka learned these tricks during his time at Citronelle. Other standouts include the Crab Roulette, Carnitas Sope and Pan Seared Rockfish. For photos of these dishes plus the watermelon salad sushi click here. Though modern in decor, the restaurant’s name is, in part, a throw back tribute to the Tally-Ho stables built in the neighborhood in 1883. The restaurant seats about 70 and takes reservations through OpenTable. Our post comes on the heels of a positive Tom Sietsema review. See what he had to say. Roasted Duck Breast not your BTM? Post your favorites in the comments section.